Darlinghurst is an inner-city, eastern suburb of Sydney, New South Wales, Australia. Darlinghurst is located immediately east of the Sydney central business district and Hyde Park, within the local government area of the City of Sydney. 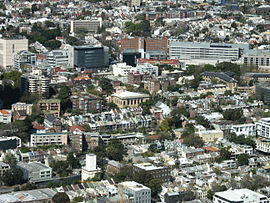 Darlinghurst is a densely populated suburb with the majority of residents living in apartments or terraced houses. Once a slum and red-light district, Darlinghurst has undergone urban renewal since the 1980s to become a rather upmarket, cosmopolitan and diverse area. Places such as Victoria Street (which joins Darlinghurst and Kings Cross) are known as culturally rich destinations. The main thoroughfare of Darlinghurst is considered to be Oxford Street which is well-known around the world as the centre of Sydney's gay community, and is home to a number of gay venues and the Sydney Mardi Gras. In recent years, Oxford Street has garnered a reputation for being Sydney's primary "nightclub strip", popular with both gay and straight clubbers, surpassing the notorious red-light district of Kings Cross in popularity. As a result, crime rates have increased in the area, particularly for assaults and robberies. East Sydney is a locality in the western part of the suburb; Taylor Square is another locality within the suburb. Kings Cross is a locality on the northern border. Darlinghurst is surrounded by the suburbs of Woolloomooloo, Potts Point, Rushcutters Bay, Paddington and Surry Hills. Completed in 1912, this three-storey brick and stone building occupies a prominent location at the corner of Darlinghurst Road and Victoria Street. It was designed in 1910 by Walter Liberty Vernon (Jahn, 1997). It still functions as a fire station and is listed on the Register of the National Estate. Darlinghurst Courthouse is an imposing sandstone building on Taylor Square. It was designed by architect Mortimer Lewis (1796–1879) in 1844, and has a Greek Revival style facade. The central block is adapted from an 1823 design in Peter Nicholson's 'The New Practical Builder' (Apperly, Irving & Reynolds, 1989). The Horizon, located in Forbes Street, Darlinghurst, is a 43-storey residential high-rise building completed in 1998. It has a distinctive scalloped facade and is finished in rendered concrete. The building was designed by Sydney architect, Harry Seidler and is controversial in that it has caused major overshadowing of the surrounding area. According to the 2011 census, there were 10,060 residents in Darlinghurst. 58.8% of people were male and 41.2% female. This was a higher rate of male residents than the national average of 49.4%. In Darlinghurst, 47.2% of people were born in Australia. The most common other countries of birth were England 6.9%, New Zealand 4.9% and Thailand 1.8%. Being an inner-city suburb, Darlinghurst had a high rate of people walking to work (36.9%). The dwelling types in Darlinghurst were mostly units and apartments or semi-detached houses. Just 2.6% of dwellings were separate houses, compared to the national average of 75.6%. Darlinghurst Public School, located on Womerah Avenue, was opened in 1884. The Sydney Grammar School is located on College Street, across the road from Hyde Park. This school is a boys-only private school which opened in 1857. The Sydney Church of England Girls' Grammar School (now called SCEGGS Darlinghurst) was founded in 1895 in Victoria Street, Darlinghurst. It moved to its current site in Forbes Street, in 1901. The former Marist College on Liverpool Street is now an apartment complex. The Church of Christ, Scientist is now a private residence. There is also the defunct St. Peter's Anglican church, Bourke Street, which is now part of SCEGGS Darlinghurst. At a federal level, Darlinghurst falls in the electorates of the Division of Sydney and Wentworth. Its current parliamentary representatives are Tanya Plibersek (Labor) and Malcolm Turnbull (Liberal). These electorates have some of the state's strongest support for The Greens. The Darlinghurst area is famous for the annual Sydney Gay and Lesbian Mardi Gras. The parade, first held in 1978 as a protest march by members of the gay and lesbian community, marks the end of a three-week festival and takes place on Oxford Street, the main street that runs through several suburbs, including Darlinghurst. The Sydney Jewish Museum is on the corner of Darlinghurst Rd and Burton St (148 Darlinghurst Rd) and features exhibitions about the Jewish community in Sydney. There are many small private art galleries in Darlinghurst, including Black Eye Gallery (Darlinghurst Rd; photography), King St Gallery on William (William St; painting), Conny Dietzschold Gallery (Crown St; contemporary art), Robin Gibon (Liverpool St; painting, sculpture), Watters Gallery (Riley St; painting, sculpture), Gallery 9 (Darley St; contemporary art) and Liverpool St Gallery (Liverpool St; contemporary art). Entry to these galleries is free, and most of the exhibitions will display the work of Australian artists. There is also a gallery in the National Art School (NAS) that hosts exhibitions in a mid-19th century sandstone building. The Eternity Playhouse, Burton St, Darlinghurst, opened in 2013, following the renovation of the former Burton St Tabernacle, which was founded in 1887. Following its purchase by the City of Sydney in 2004, plans were gradually developed to renovate the building as a theatre. The 200-seat theatre is the home of the Darlinghurst Theatre Company, and the renovation was designed by architecture firm Tonkin Zulaikha Greer. ^ a b Australian Bureau of Statistics (31 October 2012). "Darlinghurst (State Suburb)". 2011 Census QuickStats. http://www.censusdata.abs.gov.au/census_services/getproduct/census/2011/quickstat/SSC10691?opendocument&navpos=220. Retrieved 1 May 2013. ^ "Darlinghurst". Sydney.com. http://www.sydney.com/destinations/sydney/inner-sydney/darlinghurst. Retrieved 3 April 2013. ^ Aston, Heath (3 December 2007). "Oxford Street beset with violence". The Telegraph. http://www.dailytelegraph.com.au/news/opinion/thuggery-shrouds-vibrant-strip/story-e6frezz0-1111115016618. Retrieved 3 April 2013. This page uses content from the English language Wikipedia. The original content was at Darlinghurst, New South Wales. The list of authors can be seen in the page history. As with this Familypedia wiki, the content of Wikipedia is available under the Creative Commons License.